I have a few picky eaters under my roof which makes it a real challenge to figure out what to make for dinner. I would be a much more adventurous cook if I could just make what I want and know that the kids would eat it. But, tra-la-la, that’s the lament of most parents, am I right? My pickiest-eater child has suddenly decided to take pity on me (after all of his ultra-picky years) and is willing to try more things. But then the kid who used to eat anything has suddenly decided he doesn’t like rice, pork, steak or chicken. Great. Swapped one for the other. Undeterred by this, and noticing I had a can of coconut milk in the pantry, I set out to create a dish everyone would at least be willing to try and came up with a great one. 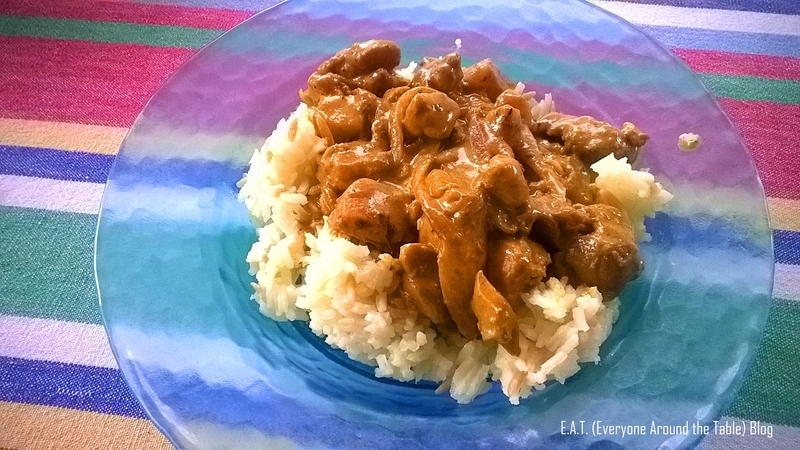 A dish even my pickiest eaters loved! If I’d had some peas, I would have added them. Wouldn’t that have looked nice? 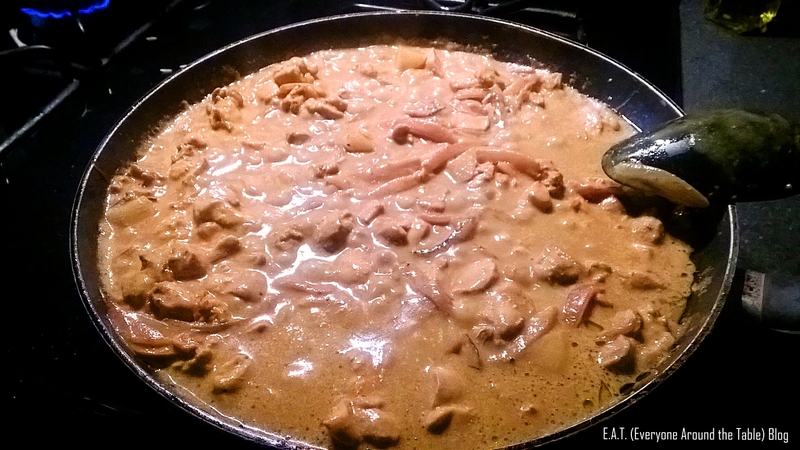 In a small pan, melt about a tablespoon of butter, then add the coconut milk, coriander and curry powder. Gently whisk until blended. Turn off the heat and set it aside. The sauce with coconut milk, curry powder and coriander. Don’t add the salt and pepper until you are simmering the sauce and chicken together. 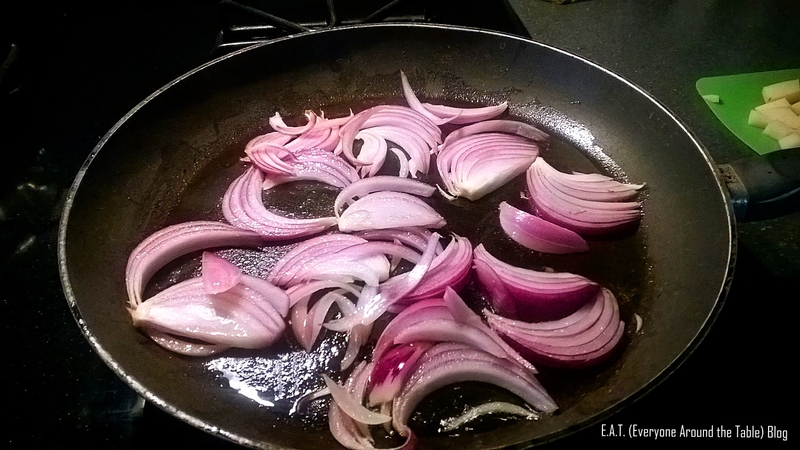 In a large skillet or dutch oven, drizzle some olive oil and heat up the pan. Add the onion slices and saute until they begin to be translucent. At that point, add the garlic and stir for a few seconds. Be careful because the garlic will burn quickly and become bitter. I love the look of red onions! I sliced them the long way so that the kids who didn’t want onion could easily pick it out (turns out they didn’t!). Add the diced chicken and turn everything over with a spatula to get the onion and garlic off the bottom of the pan and get things mixed up a bit. Do this periodically until the chicken is beige on all sides. It doesn’t have to be cooked through at this point. 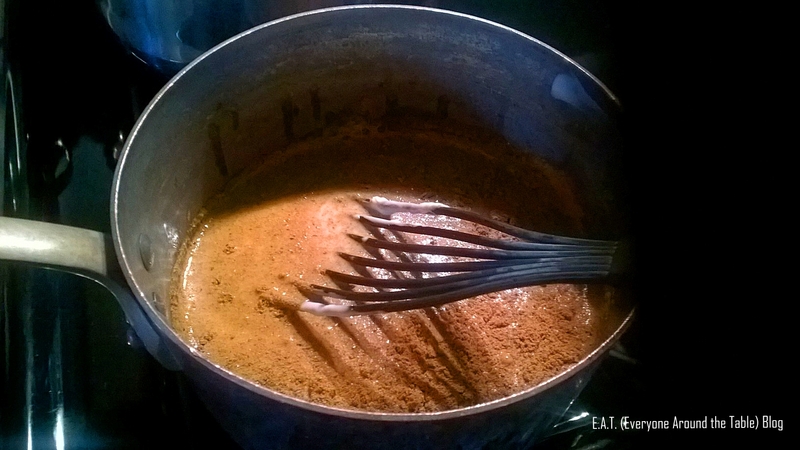 The mixture will thicken as you let it simmer. Don’t cover it or the drops from the humidity that builds up on the lid will drip back down and water down the dish. Pour the coconut/coriander/curry mixture over the chicken and stir again. Switch out your spatula for a large cooking spoon at this point because the spatula has raw chicken juice on it. Always do this when you are cooking – as soon as all sides have started to cook, ditch the raw-stuff utensil for a clean one to finish the dish to avoid cross-contamination. Lower the heat and let the whole mixture simmer and thicken until the chicken and potatoes (if used) are cooked through and tender. In the last minute or so, add the peas, which I would have done with my dish if I’d had any. It would have added a nice bit of color and another element of flavor. Serve over the rice (or quinoa or nothing). Every time I make rice, I make it this way, with rosamarina because it just tastes so darned good! Melt about 1 tablespoon of butter in a pot. Add the rosamarina and stir almost constantly until it starts to brown. At this point, it will burn quickly so before that can happen, pour the rice over it and stir to prevent the rosamarina from continuing to sit on the bottom of the pan. The butter that’s still in the pan will lightly coat the rice/rosamarina, adding some flavor. Add the water/bouillon and stir. Let the mixture come to a boil. As soon as it does, cover the pot, turn the heat to low and let it sit to start absorbing the liquid. This usually takes about 20 minutes so I try to time the coordination of making rice with making the entree so they are done around the same time. 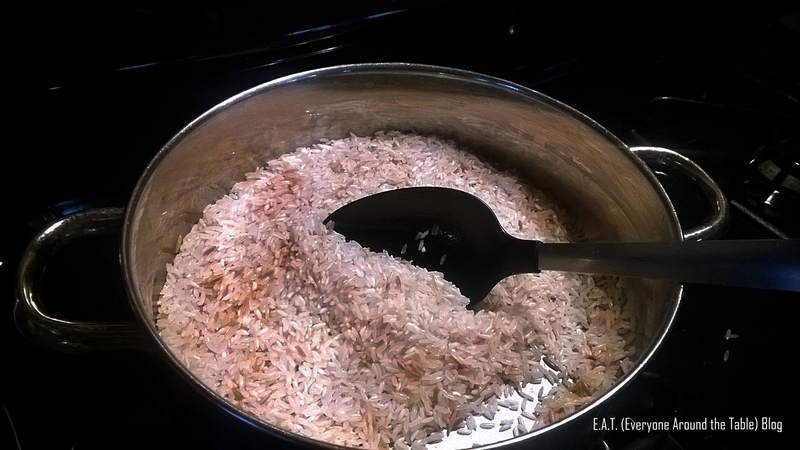 Resist the urge to lift up the lid or stir the rice because it will effect how the rice turns out. * Because the rosamarina needs to absorb the water to cook, I either lower the amount of rice I put in or add a little water/stock to compensate.